Muddle mint in sweet vermouth. 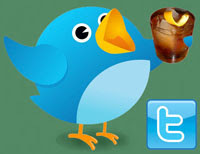 Add the rest of the ingredients and crushed ice, stir, top with crushed ice, garnish with mint sprigs, and add a straw. After work on Sunday, I was inspired by the Prescription and American House Juleps to think about what other whiskey-brandy drinks might make for a good Julep. 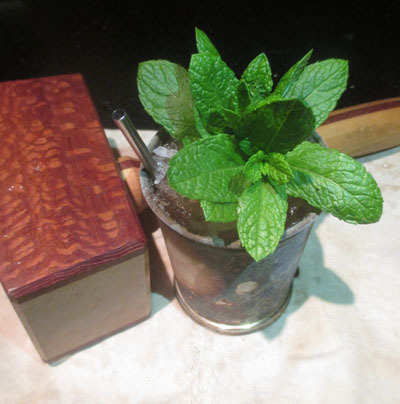 Or perhaps, I started with the angle of making a Benedictine-driven Julep given the minty note I often find in drinks containing the liqueur. Both led me to thinking about the Vieux Carré, but in the end, I settled on Jerry Thomas' Saratoga Cocktail which is like the Vieux Carré minus the Benedictine and Peychaud's Bitters. I was also curious to see if sweet vermouth would work well in a Julep similar to how Dubonnet did in the Dubonnet Mint Julep. The Saratoga Julep proffered a mint aroma that led into a malt and grape-laden sip. Next, the rye and Cognac flavors on the swallow were spiced by mint, clove, and allspice elements. Overall, the grape added a lot to the sip, and the Angostura Bitters rather complemented the mint but not taken as far as in the Magic Julep. The Saratoga is one of my favorites (in part because the three-equal-parts recipe is really easy to remember). I'll have to give this variant a try!